LONDON, England (CNN) -- Sales of the flu drug Relenza shot up 1,900 percent from a year ago as governments around the world stockpiled in preparation for a swine flu pandemic, drugmaker GlaxoSmithKline said Wednesday. Relenza sales were £60 million ($98.4 million) in the second quarter of this year, compared to £3 million ($4.9 million) in the same quarter last year, the company said in announcing its Q2 results. Glaxo also said that by the end of the year, it expects to have an annual production capacity for Relenza of 190 million treatment courses, more than a threefold increase to its previously announced maximum capacity. Relenza is an antiviral medication similar to Tamiflu that treats symptoms of the flu and helps to prevent getting it. GlaxoSmithKline started production last month of a vaccine for swine flu, also known as the H1N1 virus, the company said. It is now on track to meet the orders placed by many governments and the World Health Organization for the vaccine, Glaxo said. "To date we have contracts in place to supply 195 million doses of the vaccine," Chief Executive Andrew Witty said. "We also have a variety of agreements in place with the U.S. government to supply pandemic products worth $250 million. Discussions with over 50 governments are ongoing, with many at advanced stages, and I therefore expect further significant orders. 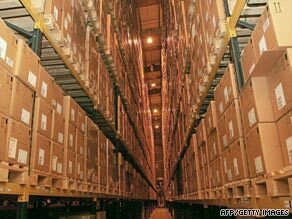 Shipments are expected in the second half of 2009 and early 2010." In an interview with CNN's Richard Quest, Witty said the new swine flu vaccine will likely be a boost to sales into 2010. "As we go forward, I think we'll see (swine flu) become more material for the company, particularly as we move into (the fourth quarter) of this year and vaccine shipments begin," he said. However, he thinks any sales boost from the planned swine flu vaccine will last only as long as the threat. "What we're doing here is responding to government needs, where they've said, `Look, we don't know how serious this is going to be but we want to be prepared'," he said. The real challenge for pharmaceutical companies is coming up with new blockbuster drugs for chronic disease, not acute outbreaks like swine flu. "I think what you see in our industry is relatively resistant to the economic downdrafts ... but we do need to constantly renew our portfolio -- that's the challenge we face." Glaxo will donate supplies of both the swine flu vaccine and Relenza to the WHO for use in developing countries, he said. Participants will receive two shots three weeks apart and will undergo blood tests to determine if they are generating an appropriate immune response to the virus, the company said. Swine flu has spread so rapidly and extensively around the globe that the WHO said Monday it was changing tactics against the virus, including stopping a tally of cases and focusing on unusual patterns. WHO declared the virus a global pandemic on June 11. More than 120 countries have reported cases of human infection, totaling more than 98,000 documented cases worldwide. More than 700 people have died of the virus, the organization said Tuesday. With 29 deaths and a huge rise in the number of cases, Britain has the worst swine flu figures in Europe. Cases of swine flu in Britain have, however, proven to be generally mild in most people, Prime Minister Gordon Brown said Wednesday. They have been severe only among a small minority, mostly where patients have had underlying health problems, he said. "Robust plans are in place" to deal with the pandemic, Brown said. By the end of the week, a new National Pandemic Flu Service will be operating in England to quickly diagnose people who have swine flu and allow them to get antiviral treatment directly from local providers, Brown said. Swine flu has spread so rapidly and extensively around the globe that the WHO is changing tactics against the H1N1 virus, including stopping a tally of cases and focusing on unusual patterns. "At this point, further spread of the pandemic, within affected countries and to new countries, is considered inevitable," the WHO said. The counting of all cases is no longer essential because it is exhausting countries' resources, the organization said. While most patients have reported mild symptoms, a rise in severe symptoms or respiratory ailments that require hospitalization should be cause for concern, it said. Governments should also pay attention to unusual patterns linked to fatal cases, the WHO said. Any changes in prevailing patterns should be flagged, including a rise in school and job absenteeism, and an increase in visits to the emergency room. An overwhelmed health system may mean there is a rise in severe cases, the organization said.